(March 2016) During my five day visit to Georgia, we met with many industry experts who provided the following information. I have also supplemented this with some data from Euromonitor. The geography and climate of Georgia are ideal for growing wine grapes. The Caucasus Mountains, rising over 15,000 feet high (3000 meters) not only divide Georgia from Russia, but protect the valleys from cold and wind, so that the grapevines can flourish. The eastern part of Georgia has a continental climate, with warm summers and cool winters. It is where the majority of vineyards are located, especially in the Kakheti Valley which produces 70% of Georgia’s wine grapes. The western part, bordering on the Black Sea is a cooler, maritime climate, and some of the rarer grape varietals come from this region, especially in the mountainous area of Racha-Lechkhumi. Interestingly, it is thought the word for wine “ghvino” originated in Georgia, because it has an older provenance than the Latin “vin” or “vino.” The fact that the vitis vinifera grapevine originates in the Caucasus Mountains, support this, though there is still debate over whether Georgia, Turkey, Iran, or Armenia is the birthplace of wine. The country boasts 40,000 hectares of vineyards, but this is down from 100,000 hectares during Soviet times, when production was ramped up to industrial levels to supply the other Soviet regions. The hectares that remain are grown by small farmers with an average of only 2 acres of vineyards. Saperavi – a red grape with ripe berry, spice and earthy notes, similar to a cross between syrah and malbec. Very delicious and made in a range of styles from medium-bodied fruity reds, to semi-sweet, or dry, tannic, complex wines made with oak. We were told that saperavi has more rsveratrol than syrah, cabernet sauvignon, and petit verdot, making it a very healthy grape. 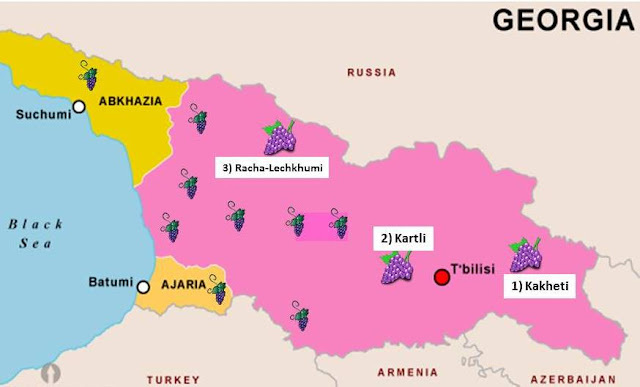 Rkatsiteli – the pervasive white grape overproduced during Soviet times, and still comprising more than 43% of all vineyard plantings, because it is easy to grow. It produces more neutral style wines featuring lemon, mineral, and straw notes with high acid. Mtsvane – a semi-aromatic white grape with floral notes, green pear, and kiwi. There are different varietals, such as Goruli Mtsvane and Kakhuri, but some producers simply write Mtsvane on the label. Many of the ancient grapes were nearly destroyed or lost during Soviet times, with its focus on mass production. Today teams of scientists are going from house to and house, searching backyards for heritage varietals. When they find a few rows or even plants, they take cuttings so they can propagate and save these antique vines from extinction. Kisi – an aromatic white grape with notes of peach, white blossom, and spice. Similar to a subdued Torrontes, this grape is not only pleasant to smell and taste, but has an easy to pronounce name with romantic connotations. From a marketing prospective, it would be easy to sell. Ojaleshi – a delicate red grape with red cherry and spice. Similar to a pinot noir, this grape is one of Georgia’s oldest and most endangered varietals. Currently there are only 10 hectares planted. 1) Kakheti Valley – the “Napa Valley of Georgia”; located about a 2 hour drive over the mountains from Tbilisi. This long valley produces some of the highest quality wines, has some of the oldest wineries, and produces around 70% of all wine. Shielded by the towering Caucasus Mountains to the north and with a river running through the middle, this valley is filled with vineyards. 2) Kartli – Located only a 40 minute drive to the northwest of Tbilisi, Kartli is a smaller region, but home to some famous old wineries, such as Chateau Mukhrani. It is known for its limestone soil and windy nights. 3) Racha-Lechkhumi – located in the mountains of Western Georgia, this region is known for producing some of the rarer varieties and the favorite wine of Stalin. It is also the location of the Golden Fleece that Jason sought. Over a day’s drive from Tbilisi, with very few unpaved roads, we were not able to visit this region. It is estimated there are around 200 commercial wineries in Georgia, and thousands of hobby winemakers, because most of the local people have been growing vines and making wine in their backyards for centuries. According to Euromonitor the largest wineries are: Badagoni, Telavi Wine Cellar, Tbilvino, and Telliani Valley, and total wine production in 2014 was 96 million liters of wine (10.6 million cases), achieving revenues of GEL809 million (US$355 million). We were told that the five largest wineries each produce around 4 to 5 million bottles annually (300 to 450,000 cases). Exports are around 30% of total production, and the largest export countries are Russia, Ukraine, and Kazakhstan. The Georgian government appears to be supportive of the wine industry, and has been encouraging more wine tourism. For example, a visa is not necessary for US citizens to visit Georgia, and upon arriving at their airport, the visitor will find several tour companies that offer wine tours. 1) National Wine Association, which is the government arm and part of the agriculture office. 2) Georgian Wine Association, an industry association currently composed of 40 wineries, which represent 75% of the production and 90% of exports. Georgia has approximately 4 million people, but only 700,000 drink wine, which creates a consumption level of only 7 liters per capita. However, of those who do drink wine, it is generally on a daily basis and part of their religion. We were told that that it is estimated that this portion of the population drinks around 100 liters per capita.